Insufficient funds or lack of funds in the issuer's account is the most common reason for a bounced cheque. A bank would stop the payment and dishonour a cheque drawn on an account with insufficient funds. A bounced cheque is a cheque that the drawer bank refuses to honour on grounds pre-determined by the bank. Bouncing cheques can invite legal action where the receiver wishes, and there are often cases where there is involvement of significant amounts, or several repeat cases have invited criminal prosecution. It is, therefore, vital for one to know how to protect you from issuing bouncing cheques. Insufficient Funds or Lack of Funds in the issuer account is the most common reason for the cheque to bounce. A bank would stop the payment and dishonour a cheque drawn on an account with insufficient funds unable to complete the transaction. To settle this, the issuer can either issue a new cheque to the receiver or the receiver can initiate legal action against the issuer. Legal action is only sustainable where a cheque is issued towards the settlement of a debt or legal liability. Banks have made it easy to track cheques through online banking and call in services. It is advisable always to issue checks against actual funds in an account and not anticipated funds. .
Signature Mismatch is a very common reason for bouncing cheques; i.e. where the signature appended by the issuer does not match the bank’s records. Despite the fact that banks have gone out of their way to call the drawer and confirm cheques when in doubt, bankers would rather dishonour a cheque with an incorrect signature than allow a fraud to perpetrate. Account holders are advised to practice their signatures often and sign cheques when settled using clear pens. Invalid Dates on Cheques refer to errors on the date of issue. 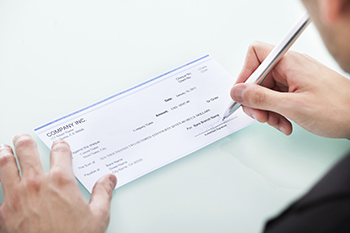 A Post Dated cheque is one which has been presented for payment before its due date (often used by traders as a commitment to settling a debt on an agreed future date) while an Expired or Stale cheque is one that is presented for payment three months after the date of issuance. These are typical payee related errors that are avoidable by ensuring the dates on the cheques are acceptable on presentation. In India, there are over 1.8 million cases in the various courts related to bouncing cheques. This number of litigations can be brought down significantly by carefully scrutinizing the cheque leaf before issuing or submitting for payment.